This entry was posted in Foot, Fungus, Nails and tagged antifungal, chemotherapy drugs, dermatophytes, discoloured toe nails, fungus, immunodeficiency virus, nail bed, nail growth, onycholysis, saprophytic fungi, yellow nail syndrome on June 12, 2012 by alwin. During Prusinski’s research she learned that MMA used in many shops costs only $20 a gallon, while a gallon of required adhesive costs $200. When you enter a salon using MMA, you will receive an instant headache from the odor. This entry was posted in Fungus and tagged acrylic nail fungus, bactericides, blood borne disease, cuticles, fungicides, microbacteria growth, MMA, nail bed, natural nail, sanitization on December 29, 2011 by alwin. 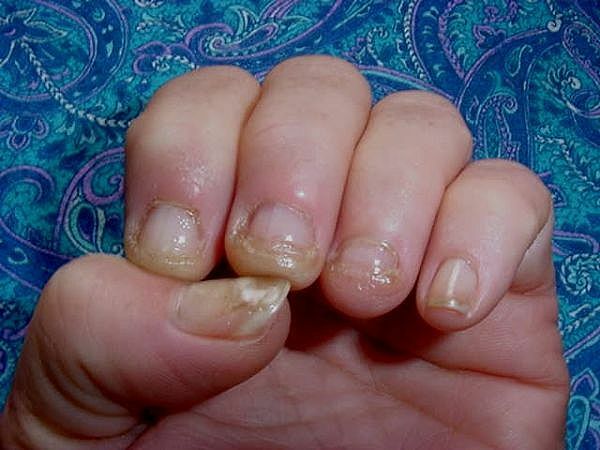 This entry was posted in Fungus and tagged acrylic nail fungus, cosmetologist, fungus, infection, lavender oil, nail laquer, natural nail, onycholysis, tea tree oil, white vinegar on December 29, 2011 by alwin.